This is kind of amazing. Legendary street fashion photographer Bill Cunningham died two years ago, leaving behind a massive body of work documenting the last 40 years of the fashion world. Somewhat surprisingly, he also wrote a memoir that seemingly no one knew about. He called it Fashion Climbing (pre-order on Amazon). Fashion Climbing is the story of a young man striving to be the person he was born to be: a true original. But although he was one of the city’s most recognized and treasured figures, Bill was also one of its most guarded. Written with his infectious joy and one-of-a-kind voice, this memoir was polished, neatly typewritten, and safely stored away in his lifetime. He held off on sharing it — and himself — until his passing. Between these covers, is an education in style, an effervescent tale of a bohemian world as it once was, and a final gift to the readers of one of New York’s great characters. The NY Times, where Cunningham worked for decades, has more information on the book. Sad news from the NY Times: legendary street fashion photographer Bill Cunningham has died today at the age of 87. In his nearly 40 years working for The Times, Mr. Cunningham operated both as a dedicated chronicler of fashion and as an unlikely cultural anthropologist, one who used the changing dress habits of the people he photographed to chart the broader shift away from formality and toward something more diffuse and individualistic. At the Pierre hotel on the East Side of Manhattan, he pointed his camera at tweed-wearing blue-blood New Yorkers with names like Rockefeller and Vanderbilt. Downtown, by the piers, he clicked away at crop-top wearing Voguers. Up in Harlem, he jumped off his bicycle — he rode more than 30 over the years, replacing one after another as they were wrecked or stolen — for B-boys in low-slung jeans. I saw Cunningham out on the streets of NYC twice and both times chills ran up my back watching a master at work. Unless Cunningham had something in the can before he died, it looks as though the last of his On the Street features is about black and white fashion. Tonight might be a good time to watch the documentary Bill Cunningham New York — it’s available on Amazon (free with Prime). In March, the New York Historical Society is mounting an exhibition of photographer Bill Cunningham’s project, Façades. Scouring the city’s thrift stores, auction houses, and street fairs for vintage clothing, and scouting sites on his bicycle, Cunningham generated a photographic essay entitled Façades, which paired models — in particular his muse, fellow photographer Editta Sherman — in period costumes with historic settings. Bill Cunningham New York, a documentary film about the unassuming king of street fashion photography, is out on DVD today. “We all get dressed for Bill,” says Vogue editor Anna Wintour. The Bill in question is 80+ New York Times photographer Bill Cunningham. For decades, this Schwinn-riding cultural anthropologist has been obsessively and inventively chronicling fashion trends he spots emerging from Manhattan sidewalks and high society charity soirees for his beloved Style section columns On The Street and Evening Hours. Cunningham’s enormous body of work is more reliable than any catwalk as an expression of time, place and individual flair. The range of people he snaps uptown fixtures like Wintour, Brooke Astor, Tom Wolfe and Annette de la Renta (who appear in the film out of their love for Bill), downtown eccentrics and everyone in between reveals a delirious and delicious romp through New York. But rarely has anyone embodied contradictions as happily and harmoniously as Bill, who lived a monk-like existence in the same Carnegie Hall studio at for fifty years, never eats in restaurants and gets around solely on bike number 29 (28 having been stolen). It got great reviews…currently 98% on Rotten Tomatoes. Looks like Bill Cunningham New York will be showing around the US starting with New York on March 16th. (Film Forum!) And hark, a trailer. If you don’t take money, they can’t tell you what to do. That’s the key to the whole thing. The opening night feature of this year’s New Directors/New Films is the world premiere of Bill Cunningham New York (USA, 2010) on Wednesday, March 24, at 7:00 p.m. at MoMA. Director Richard Press’ documentary is a heartfelt and honest film about the inimitable New York Times photographer, who has for decades lovingly captured the unexpected trends, events, and people of Manhattan for the Styles section of the newspaper. The film shows Cunningham, an octogenarian, riding his Schwinn bicycle to cover benefits, galas, and fashion shows around Manhattan, and illustrates how his camera has captured the looks that have defined generations. I couldn’t really find any other information online about this film. They should at least get a trailer up on YouTube or something. Update: No trailer yet, but there’s a web site for the film with screening info, etc. Here are a pair of articles from 2002 on street fashion photographer Bill Cunningham, who currently plys his trade for the NY Times. (I love Cunningham’s On the Street dispatches.) The first is Bill on Bill, where the photographer recalls how he got interested in fashion and photography. As a kid, I photographed people at ski resorts — you know, when you got on the snow train and went up to New Hampshire. And I did parties. I worked as a stock boy at Bonwit Teller in Boston, where my family lived, and there was a very interesting woman, an executive, at Bonwit’s. She was sensitive and aware, and she said, “I see you outside at lunchtime watching people.” And I said, “Oh, yeah, that’s my hobby.” She said, “If you think what they’re wearing is wrong, why don’t you redo them in your mind’s eye.” That was really the first professional direction I received. The second article is a collection of recollections of Cunningham from some of the people he has photographed. He taught me how to tell a story with pictures and that it didn’t always involve the best image. I’d say to him, “But isn’t this a better photo?” And he’d say, “Yes, child, but this photo tells the story better.” For him, it wasn’t about the aesthetics of photography. It was about storytelling. Here’s another shot Cunningham made that same day which didn’t end up in the paper (Garbo’s got her hand over her face). 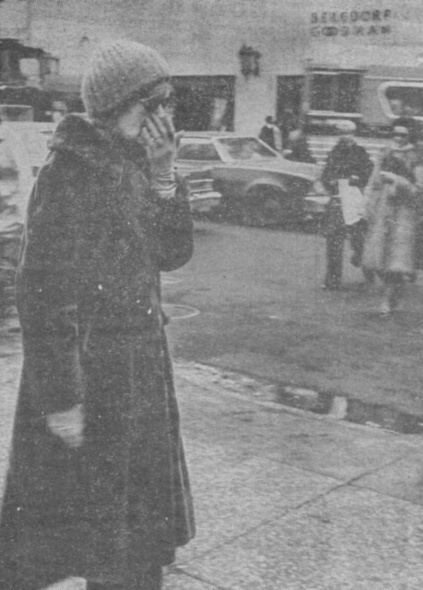 Interestingly, street photos of Garbo were not particularly rare. Here are a selection from the 1980s, including several that feature Garbo in similar clothing. Many of them were taken by creepy paparazzo Ted Leyson, who stalked Garbo for more than 10 years in NYC. Leyson took what is believed to be the last photo of Garbo before she died in 1990. The history of the hobble skirt. The term ‘hobble skirt’ came into popular use in the early 1910s, when a European fashion trend started by French designer Paul Poiret introduced long skirts that were narrow at the hem, thus ‘hobbling’ the wearer. Some attribute one of Poiret’s inspiration to Mrs. Hart Berg, the first American woman to join the Wright Brothers in air. To keep her skirts from flying out of control while airborne, she tied a rope around them below the knees (Katherine Wright, sister of the flight innovators the Wright brothers, also did the same shortly afterwards). For a short while, the tighter the skirt, the more fashionable it was. This also brought about accessories such as the hobble garter (you can see one in tbe PBS series The Manor House) designed to limit the wearer’s stride so that she would not cause the skirt to rip. This trend died shortly afterwards due to the impracticality of such a garment, particularly with the introduction of cars (the skirts making getting in and out of one a bit of an adventure). Bill Cunningham casually mentioned the hobble skirt in a recent On the Street feature about pencil skirts. I’ve not been paying enough attention to Bill Cunningham’s street fashion photography slideshows. Each week, Cunningham goes out on the streets of NYC to find out what people are wearing. Even better than the photos are his enthusiastic descriptions of what he’s found. Update: Cunningham’s video journals are now available on YouTube for easy watching/embedding.